The prize was awarded in London by the Offshore Support Journal, and presented to the President of the Shipyard, Mr. Manuel Rodríguez, at the Gala held. 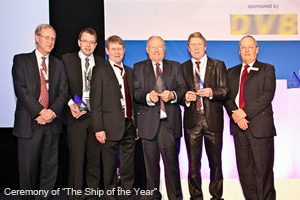 Vigo, 29th of February, 2012.- THE NORTH SEA GIANT, a vessel built by the Spanish Shipyard, located in Vigo, METALSHIPS & DOCKS, has received the prize “Offshore Vessel of the year 2012”, a recognition awarded every year by the British editorial, Offshore Support Journal. The prize was awarded in London where the president of the Shipyard, Mr. Manuel Rodríguez was present along with the the owners of the vessel, Mr. Knut and Mr. Harald T. Klepsvik, from NORTH SEA SHIPPING AS, as well as the designer, Mr. Dag Yddal from SAWICON AS. The NORTH SEA GIANT is a multipurpose offshore construction vessel (OCV), the largest of its class built to this day. This offshore vessel was delivered in March last year, and has been acknowledged as the best offshore vessel built in 2011 due to its high grade technology, redundancy and innovating design and for its outstanding operating capacity. The vessel, built at the Spanish shipyard was nominated along with three other offshore vessels developed at Cosco Qidong Shipyard (China), Samsung (Corea) and Damen (Holland). At the ceremony which took place in London, the president of Metalships & Docks, pointed out that this accomplishment could not have been achieved without the effort of the entire human team at the shipyard, including all subcontractors. THE NORTH SEA GIANT has 156 meters length overall, 30 meters breadth and more than 22 MW installed power. The vessel is prepared to accommodate 120 crew members and its structure is particularly outstanding, due to its heliport on aft and due to the bridge on the vessels 6th deck, with a total area of 300 square meters. The vessel has an industrial size galley, a restaurant, a lounge, a gym, a laundry, a cinema and a sauna amongst other services. It has the capacity to carry out almost all kinds of offshore jobs, thanks to its five VOITH thrusters, which give an extraordinary DP capability and to the exceptional crane capacity. At this moment the vessel is undertaking work related to supporting oilrig platforms in the north of Scotland.